Mihaela Vorvoreanu (aka Mickey, aka Dr. V) is Senior Program Manager at Microsoft Research (MSR), where she drives research-based innovation and conducts scholarly research. Before joining MSR, she was Associate Professor in the Purdue Polytechnic Institute, where she created one of the first undergraduate programs in User Experience Design. Her areas of expertise focus on UX, Strategic Communication, and Qualitative Research Methods. 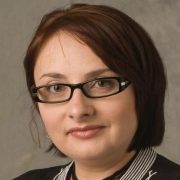 For comprehensive lists of Mihaela’s publications, please see her profile on Microsoft Academic and Google Scholar.